Around 100 Brexit supporters have joined the march from Sunderland to the House of Commons. 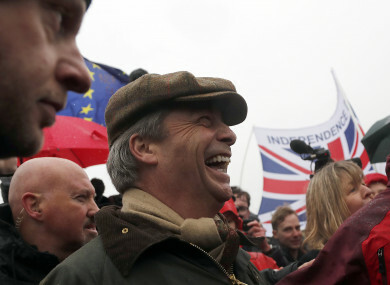 BRITISH MEP NIGEL Farage has begun a 435-kilometre march to London to demand that Britain leaves the EU this month. Around 100 Brexit supporters have joined the Eurosceptic politician on the journey from Sunderland to the House of Commons, which is expected to conclude on 29 March. Speaking at the start of the march today, Farage explained to reporters that the march was beginning from the northeastern city because it was a “symbolic” location. “It was the Sunderland result on the night of the [Brexit] referendum that made us think — wow, this is going to happen,” he said before setting off. However, Farage also admitted that he intends to cover just a third of the trek to London. “Unfortunately, I have a European summit to go to, one or two things like that,” he told the BBC. It comes as British Prime Minister Theresa May attempts to push her EU withdrawal deal through the House of Commons for a third time. If it is approved, the prime minister will ask the remaining 27 EU leaders to sign off on a Brexit deadline extension through June to allow parliament to pass the necessary legislation. If the deal is rejected again, May will have to seek a longer delay that some EU leaders have said could last through the end of next year. However, many on the mach felt that an extension would go against the will of those who voted to leave the EU. “We are a little forgotten by the politicians,” retired banker Christopher Treggelis said. “My democratic vote has been ignored,” pensioner Steve Coward added as the group set off along their North Sea route for the town of Hartlepool some 20 miles to the south. “I’m taking to my second right, which is to protest peacefully about the parliament ignoring my democratic vote,” he added. Other marchers brandished Union Jacks and signs reading “Democracy” and “Liberty”. Some said that any economic pain caused by the breakup would be short-lived and worth the benefits of greater independence. Sunderland store owner Janice McBeth said she was sure “this country will thrive” down the line. The march is designed to echo similar processions witnessed in England’s northeastern coalfields in the 1930s that saw workers protest poverty and the closure of a big shipyard. The Jarrow March of 1936 was the most famous, with a few hundred people reaching London and treated as heroes once they returned home. Email “Nigel Farage begins 435km march against 'Brexit betrayal', but admits he won't actually finish it”. Feedback on “Nigel Farage begins 435km march against 'Brexit betrayal', but admits he won't actually finish it”.